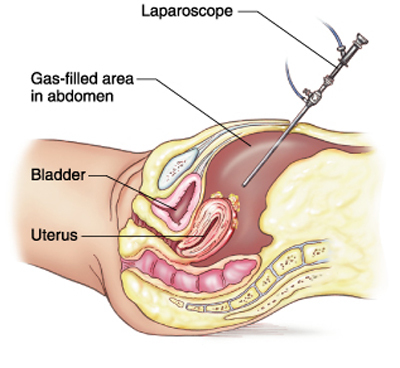 Laparoscopy is a minimally invasive surgery in which small incisions (3-10 mm wide) are made, typically one in the naval, which is the most common site for the scope (laparoscope) to be inserted. Two or three smaller incisions may be made along the sides of the abdomen, for the passage of highly specialized surgical instruments. Attached to the end of the laparoscope is a light source and a camera which transmits images from inside the patients abdomen to television screens for the surgeon and the surgical team to view in high resolution. The benefits of laparoscopy include smaller incisions, shorter recovery time, and less pain and scar tissue. Recovery depends upon the procedure performed and the severity of the condition. Generally, patients can return to normal activity with few restrictions 1-2 weeks after surgery.